In the unpredictable environment of mobile tactical operations, success can turn into failure in the blink of an eye. With the mission at stake, communication is critical and reliability is essential. That’s where SCI Technology’s TOCNET®-Vehicular (TOCNET-V) offers a vital edge—delivering full-scale communications capabilities wherever the mission takes you. Battle-tested and refined, TOCNET-V provides superior solutions for the complex operational requirements of existing and emerging vehicle platforms. Ideal for any vehicular environment, TOCNET-V has reliability and functionality built into its DNA. After successfully deploying TOCNET-Classic, SCI leveraged its extensive operational heritage in Tactical Operations Centers (TOCs) and other systems to place TOCNET-C’s capabilities in a package suitable for vehicle-borne applications. Today, TOCNET-V is fielded in thousands of tactical vehicles throughout the Department of Defense, providing clear intercommunications to both in- vehicle operators and off-platform warfighters networked together. SCI’s rugged, waterproof packaging provides users with uninterrupted communications under any conditions, and on any mobile platform. TOCNET-V’s knobbed crew station interface units enable “blind-touch” operation, allowing operators to switch between different communication assets without turning away from the road, sighting system, or other mission-critical interfaces. 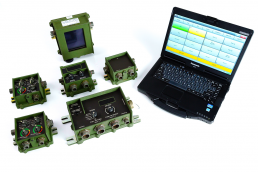 All knobbed interfaces operate identically, minimizing training and operator workload. Working in tandem, SCI’s consistent, easy-to-use interfaces and crisp communications help ensure mission success. Fielded throughout all branches of the U.S. Armed services.